This little girl never ceases to amaze me! She is so strong and so beautiful and is just ..... AMAZING!!!! I've had good intentions. Really. I've written so many updates, in my head. I just never had a chance to sit down at the computer and type them up. Life has just been crazy. I have been thinking a lot lately about the past year. So many positive things have happened. 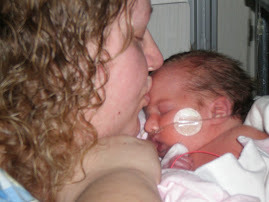 The best and most life changing was bringing Elaina home. She has had such a positive impact on our little family! She is such a sweet happy little girl. It is so weird to think that one year ago she was still at South Davis and we were doing our weekend transitions home. On April 2nd she will have been home for exactly one year! It has been an amazing year too! Hmmm.... Let me update on all my kids. Elaina is doing so many things now that she wasn't doing before. She can crawl like a madwoman! In fact, I have to keep her "confined" to the living room or she gets herself into trouble, lol. She can sit all by herself and pull herself into kneeling positions. She likes to sit with both of her legs under her behind so that it's easier to kneel up. She is "investigating" the whole climbing thing. I have a Wii Fit Balance board that is on a platform, making it 4 inches taller. She started putting 1 knee up on the balance board, but couldn't quite figure out how to climb. Well the other night she did it. She climbed up on the board all by herself! Of course once she was up there she didn't quite know how to get down. She hasn't tried to climb again, but I think it won't be long until she's regularly climbing up onto things. Her physical therapist is very pleased with her progress. She told me that Elaina is getting a lot stronger and is actually standing (with assistance only) much better. Elaina has a cute pair of pink Dafo's (foot/ankle braces) that she wears to help her support her weight. She does not like them. At all. In fact she cries the whole time they are on, but I keep putting them on her for small periods of time to help her get stronger. Hopefully some day she'll be able to walk! My little miracle baby turned 3 in January. Unbelievable! She was extraordinarily cute that day. She knew it was her day and she got spoiled rotten. Her favorite gift was the balloon bouquet that Ben gave her. I put her on the floor with the balloons and she was the happiest girl in the world. Elaina still loves her Disney movies. She goes through phases with which movie is her favorite. At the moment it's The Little Mermaid again. But this is new. For the last 3 months it's been Cinderella. Before that it was Monster's Inc. If her movie is not on, Elaina is crying. Not just whimpering, mind you. Full blown temper tantrum. She gets herself so worked up that she's gasping for breath and choking on the mucus that she's created with her tears. So, Mommy spoils her and lets her watch her movies all day long. :) It just breaks my heart when my normally happy little Princess cries... (I know I'm a big softie, but you pick your battles right?) So yeah, she's learning the fine art of manipulation and I'm loving every minute of it! She's started pre-school, but because she's so medically fragile, I'm having her home schooled for the remainder of this school year. So we get lots of visits from lots of new friends every month. She'll most likely go to the classroom in the fall. Very exciting! Medically? We see Cardiology in June, but her sats are great. Still in the high 80's on the 1 liter of oxygen. She had an MRI in November, it showed that the swelling in her brain from the aspiration episode she had when she was 3 months old has completely healed! So I've been able to wean her completely off her seizure medication. It caused several weeks of sleepless nights as her body adjusted to less and less medication, but I'm so glad that she no longer needs the med. We see her Neurologist next week for a follow up, but I just know that she's fine in that area. I also took her for an Ophthalmology consult in December. She's been diagnosed with Optic Nerve Hypoplasia, which just means that her optic nerves are very small. It makes her legally blind, but he told me that she still has a lot of useful vision. She's farsighted because of it, but he didn't think that glasses would help her at all. She has one "lazy" eye, but he doesn't want to do surgery quite yet. So as of right now, we're just watching to see how she progresses. She's had a couple of ear infections, but otherwise she's managed to stay healthy and out of the hospital (knock on wood!) since last May! Ben turned 8 last fall and is in the 2nd grade. His newest passion is Cub Scouts. He just earned his Bobcat and looks forward to Scouts every week. He's also a video game junkie. We got a Wii for Christmas (I really, really, really love my Wii Fit and that was the main reason for getting the Wii) and Ben loves to play as often as possible. 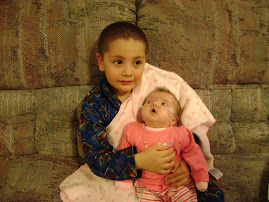 He's still head over heels in love with his sister and is in awe of how much she loves him. :) He is very excited for spring and summer and can't wait to spend as much time as possible outside. His reading is improving and he's a pretty happy little dude these days! I just got him a bunk bed, and he is thrilled to have claimed the top bunk. I can't believe how grown up he is. Why did I need a bunk bed? Well, that's because my step-son Chance came home! I don't know that I've talked about him on my blog before. Chance and Ben are brothers, and share the same Dad. When my husband, their Dad, died in 2003, it was really rough on Chance. He came to live with me and his Dad when his Mom died in 1997 and with his Dad gone, he was having a really tough time coping. Can you blame him? I can't. He did the best he could with the circumstances at the time. Unfortunately, he made some bad choices at the age of 14 which necessitated him being placed in a Foster Home. It broke my heart to do it, but ultimately, I know that it was what was best for him as well as for our family. Well, there is a happy ending! He worked really hard in therapy and in his placements, and last November the Judge decided that he could come HOME! SO, that means that TWO of my three children got to come home to me in 2010. It was awesome. Chance just turned 19, and is joining the Army. He is staying with me until he leaves for basic training. While it scares me to think of him being in harms way, I know that he's doing what is right. He has some really amazing goals and ambitions, and joining the Army is really going to help him. He wants to work in Law Enforcement, and feels that time spent in the Army is only going to benefit him in his long term goals. Amazing. I am SO proud of him and the choices he is making. He is a good big brother and Ben just loves having him home! What about me? Well, I just run around crazy. Nothing new there! Being a single Mom, working and taking care of my house as well as 3 kids is exhausting, but worth every moment of it. The rewards are there. No wonder I have a hard time finding the energy to blog! If I get 5 hours of sleep I feel like I've won the lottery. :) About a month ago I got the "Spring Cleaning" bug and completely re-organized my little apartment. I moved all the furniture and completely re-arranged every room in the place. The best move was taking the computer out of my bedroom and putting it in the living area. My kitchen is very small, and I honestly didn't think a kitchen set would fit in there, but I found one that works perfectly. So, I turned my dining room into an office and now I can have Elaina in the living room playing while I work instead of having her in her crib, which I hated doing. Hopefully this will also allow me a little more flexibility with my computer time and I can start blogging more frequently. I've really missed blogging and want to get back into the swing of things! Well, I wish I had time to post tons of pictures, but I have a feeling that if I don't post this now, it will just sit in my drafts. It's already taken me 2 days to get it written up this far! I will try to put some pics up soon. Well, that was sure a crazy week! Poor Elaina DID NOT like being back in the hospital. I don't think I've seen her pouty lip quiver as much in her whole life as I did the 4 days she was at Primary Children's this past week. We got to come home Thursday evening and she slept most of the following 24 hours. Don't get me wrong, she'd wake up.... but after about 20 - 30 minutes she'd drift back to sleep. Being in the hospital is exhausting! The good news is that she's stable from a Cardiology standpoint, and her numerous blood cultures and mucous samples never grew anything. So the conclusion is that she just didn't have any reserves to fight off her double ear infection and (assumed) strep throat. To make matters worse, she didn't tolerate the changes in her feedings. We've put the increase on hold for now, she needs to get feeling better before we make any big changes. Part of the problem with the feedings, was that PCMC didn't have her "brand" of formula in house, and the person that orders them was on vacation. Hmmm. SO, dietary put her on a similar formula and then increased her volume from 700 to 1030. It was not a gradual increase, just BOOM, here ya go! Well, Elaina's body did not like the different formula, and the fact that the volume was increased so drastically caused us some grief. She turned into a little mucous ball, and was gagging and retching several times an hour. Because of her Nissen, she's unable to throw up, but that doesn't mean that her poor little body didn't try. She was so miserable. She couldn't even sleep for more than 30 minutes at a time and because of the aspiration risk, she didn't get put on her bi-pap for 2 nights. Poor baby. I finally brought in my formula from home and the doctor rescinded the order for increased feeds. 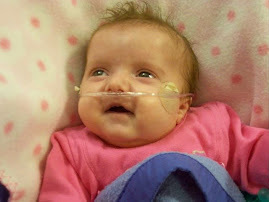 Within 24 hours her oxygen requirement was down from 4 liters to 1.5 liters, and she was gagging and retching much less. Once we were close to her baseline oxygen needs, we only had to wait until she was 24 hours without a fever. Well, we -Dr Black included!- were so anxious to get discharged that he wrote the orders and we were packed up and ready to go when the 24 hour mark hit. It was SO NICE to get home! I think Elaina was a little confused, because she was still unhappy when we first got home, but after her "rest day", she's back to her happy self. Oh, and this morning, she's back to her 1 liter need of O2 and still satting high! Well, as much fun as it has been to be at home, Miss Elaina decided that she missed all the hustle and bustle of the hospital and we're back at Primary Children's for a little "tune up". She's been battling a double ear infection for a few weeks, and did really well after the first round of antibiotics. We went back to the doctor last Monday for a 2 week follow up and her ears were looking good. She had a pretty good, uneventful, week until Sunday.... She woke up Sunday morning and was a little fussy. This is not normal for Elaina, she's a pretty mellow, laid back and happy girl, so when she's fussy she's got a good reason. She was really sleepy as well, in fact she took a 5 hour nap! After her nap I had her in her saucer and felt like I needed to get her out. When I did, she was really blue and her arms and legs were really cold. I took into the bedroom and snuggled her in a blanket while I pulled out the pulse ox... no reading... I quickly pulled out my handy dandy portable suction machine and suctioned quite a bit of gunk out of her nose and throat. She still looked blue. I increased her oxygen and finally got a reading on the pulse ox. 72%. Not good, especially on increased O2. Her legs and arms were still cold so I tossed some PJ's in the dryer to warm up and took her temperature while I waited. 102.2 degress. Not good. I gave her some Tylenol and put the toasty warm pajamas on. Her sats went up to 78. A little better but still not great. I decided to put Ben to bed (not only because it was past his bedtime, but he was freaking out - silly boy) and I called the on-call doctor (because it was 9:30 on a Sunday night). He told me in no uncertain terms that I was to take her to the ER at Primary Children's. I called a friend to come and sit with Ben until my Mom could get there and loaded Elaina up. Once we got to the ER, they took one look at her coloring and scooped her away and put her in a room. Her ear infections have come back and we're pretty sure she's got Strep throat. In all the chaos of chest x-rays, and hustle and bustle of the ER somehow the culture wasn't done. The ER docs decided it was best to admit Elaina so that we could make sure that it wasn't a cardiac event causing her sats to drop so suddenly and so that she could get some good IV antibiotcs (it only took 2 pokes to get the IV and we still have it! knock on wood!) She had a rough night Sunday night with fever and a bi-pap mask that didn't fit very well. She also missed a dose of her Revatio (aka viagra - for her pulmonary hypertension) and we think that contributed to her rough night as well. She's currently on 3 liters of O2 (she came home on 1 liter) to keep her sats in the 80's. So far the Viral panel has come back negative, so hopefully it's just her ears and throat. She's coughing a lot more and seems to have a little more of a struggle to clear her secretions. We took a trip to Cardiology for an Echo yesterday and the cardiology team told me that her heart function still looks really good, so they don't think that her increased oxygen need is due to heart failure or a sudden event with her heart. I cannot tell you what a relief it was to hear that!!!!! So at this point the general consensus is that her reserves are just a little low after fighting off a double ear infection a couple of weeks ago, so she just needs a little extra help with oxygen right now while her body is fighting. On a postive note, this has given us the opportunity to fine tune some of Elaina's meds and also increase her feedings, both calorie and volume, while under the watchful eye of doctors and nurses. Another positive is that Dr Black gets to be her attending physician, and although the in house team of residents is taking care of her, Dr Black is signing the orders and is in control of the labs, etc. The goal right now is to be able to go home as soon as possible. We're hoping to get Elaina weaned down to 2 liters of O2 before coming home. I'm aiming for Wednesday, but we all know that Elaina does things in her own time and on her own schedule. We were supposed to have a Cardiology visit next week, but since she had the echo already, they want us to follow up in 4 - 6 weeks, once she's feeling a little bit better. I don't have a laptop with me this admission, so I'll try to update when I can. Please pray that we get to come home tomorrow and that Elaina will once again show everyone how strong she is. So many of the staff her haven't seen her in almost 2 years and they are amazed at how big she is and how good she looks (even though she's sick!). I think she's feeling a little bit better today, she's actually given the nurses a few smiles! We're in room 3061 if anyone is at PCMC and wants to come say hello!